Pumped up volume up to 16X with the first double shot brush that scoops up an extra shot of plumping formula for the most pumped up volumizing lashes ever. 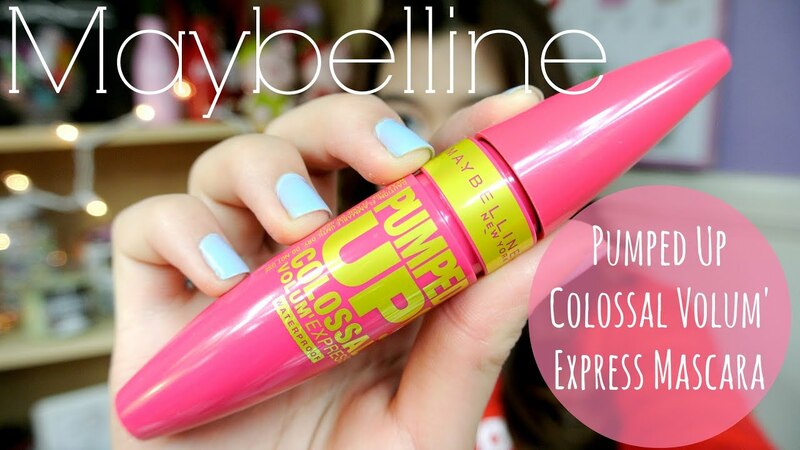 Lashes go bigger, bolder, more extreme with Maybelline New York Volum' Express Pumped Up! Ingredients: Water, Paraffin, Potassium Cetyl Phosphate, Acrylates Copolymer, Beeswax, Carnauba Wax, Ethylene/Acrylic Acid Copolymer, Steareth-2, Cetyl Alcohol, Safflower Seed Oil, Phenoxyethanol, Hydroxyethylcellulose, Acacia Senegal Gum, Ethylenediamine/Stearyl Dimer Dilinoleate Copolymer, Sodium Dehydroacetate, Caprylyl Glycol, Hydrogenated Jojoba Oil, Hydrogenated Palm Oil, Propylene Glycol, Disodium Edta, Soluble Collagen, Silica, [+/- May Contain: Ci 77491, Ci 77492, Ci 77499/Iron Oxides, Ci 77007/Ultramarines, Ci 77891/Titanium Dioxide, Mica, Ci 75470/Carmine, Ci 77288/Chromium Oxide Greens, Ci 77742/Manganese Violet, Ci 77510/Ferric Ferrocyanide], Alcohol Denat., Thylhexylmethoxycinnamate, Dimethicone Crosspolymer, Sododecane, Isononylisononanoate,Polyurethane-2, Menthyllactate, Disteardimoniumhectorite, Polymethylmethacrylate, Phenoxyethanol, Peg-9 Polydimethylsiloxyethyl Dimethicone, Acrylates/C10-30 Alkyl Acrylate Crosspolymer, Sodium Hydroxide, Disodium Stearoyl Glutamate, Ethylhexylglycerin, Carnosine, Sodium Dehydroacetate, Peg-12 Dimethicone, Disodium Edta, Lycium Barbarum Fruit Extract, Chlorphenesin, Pvp, Acrylates Copolymer, Tocopherol, Ascorbyl, Palmitate, Panthenol, Potassium Sorbate, Aluminum Hydroxide, Citric Acid, Peg-9, Glutamylamidoethyl Indole, Acetyl Hexapeptide-1, Dextran. [+/- May Contain: Ci 77891/Titanium Dioxide, Ci 77491, Ci 77492, Ci 77499/Iron Oxides, M New/Nouveau Ica].